In an age before Lady Gaga, stadium concerts and amplified noise, folk musicians filled the world with the sounds of the people. Their music created connecting threads for people and cultures around the planet to join together and share age old traditions, hopes and dreams. The music told the stories while inviting audiences to step forth in participation. 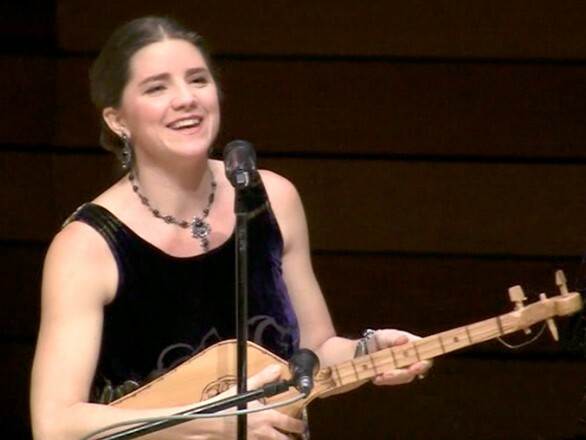 The line between musician and audience became blurred and while folk music still has many strong roots around certain parts of the world this has been a central source of inspiration behind Megan Danforth and her creation and founding of the Rogue World Ensemble. 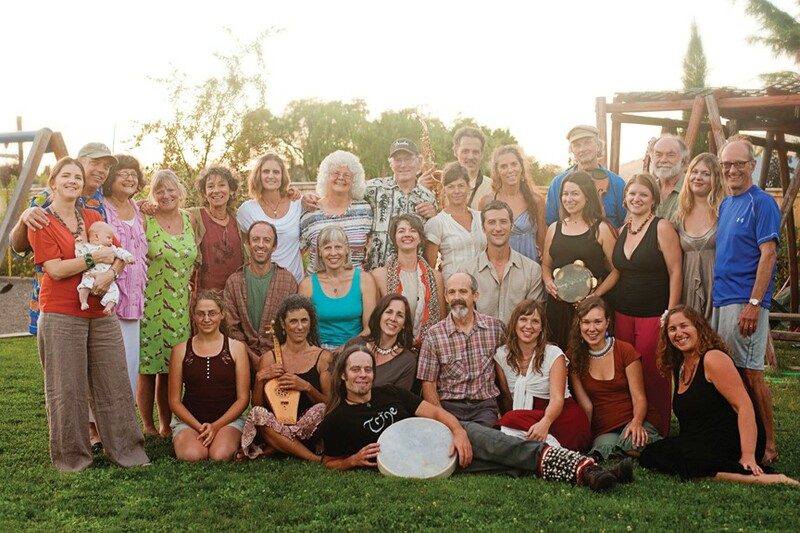 The Rogue World Ensemble is a community choir based in Ashland and dedicated to the songs and music which blur the lines between those on stage and those in the audience. Megan spoke with us on the phone to share a little bit more behind the vision of her work. Megan, thanks for speaking with us today and congratulations on the birth of your new child. There must be many new songs in your life and household at this moment. Indeed! We welcomed Rowan Wade Danforth into the world on July 11th, making my 7-year-old son, Orion, a big brother. It’s been a beautiful summer becoming a family of four. Of course, one always forgets how much work a newborn is and yet this phase is so fleeting, so I’m relishing it. And singing, yes! Always a ditty; the diaper ditty, the fussy ditty, the sleepy ditty, the playful ditty. So fun to sing what arises spontaneously through nurturing children. Can you tell us a little bit about how you first started getting involved with music and singing? I was born into music and singing. My first memories of my father are with his guitar at my bedside singing lullabies. I grew up singing with him and performed with his accompaniment for the first time when I was 7, at a school assembly. But singing remained a hobby for most of my life, one of those talents that I pursued a little but not wholeheartedly. When I was in my late twenties I lived near my folks in Vermont, which allowed my father and I to really nurture our folky/bluesy duo and we performed quite a bit. It was also at this time that I joined the River Singers, a world music choir directed by Mary Cay Brass. My mother, father, and my husband were all in the choir as well. I loved the feeling of community that choral singing cultivated, and loved singing in other languages. You had originally planned and studied to become a counselor and then ended up having a life changing experience that set you on track to create the Rogue World Ensemble. Can you tell us a little bit about this? Yes, I never gave any serious thought to pursuing music as a career. I spent a few years after college doing biological research in Montana, which I thoroughly loved. I worked for the Greater Glacier Grizzly Bear DNA Project in Glacier National Park and spent hundreds of nights in the wilderness. This experience set me on the track of studying the human/nature relationship, which then brought me to studying ecopsychology and transpersonal psychology at Naropa University. I envisioned myself as a body-oriented psychotherapist, bringing together yoga therapy and counseling. All the while I did continue to sing because I loved it. Once we moved to Ashland, I found myself really trying to find balance between the pursuit of becoming a therapist and my musical involvements. It just seemed that opportunities kept arising for me to sing more and more. That life-changing experience you refer to happened when I was in a yoga teaching training. It was truly just a moment, just a fleeting thought that I later remembered and then realized it was the whisper of a deep guiding voice. I was listening to our teacher talk about how inspired she was when she spent intensive time working with master yogis, how she couldn’t wait to “unpack her bag of goodies” that she had acquired and discover how she could share them with her students back home. It was in that moment that the thought, “That’s how I feel when I am at music workshops working with master musicians” flew through my mind. It wasn’t until a few days later that I then asked myself, “Then why aren’t you pursuing music?” One of my choral mentors had previously told me to start a world music choir in Ashland and I thought she was nuts! But then I decided to courageously take the leap and I made the decision to do it, to let go of the therapist path and to follow the stepping-stones that I felt the universe was placing in front of me in the direction of music. How do you see music as playing a healing role to both the audience and its creators? I just got goose bumps! This is where so many of my interests come together. As I deliberated over the decision between music and psychology, I realized that one of the reasons I loved choral singing so much was because of the deep harmonic connection I felt with others as well as its power to heal. At my first 10-day choral intensive (this was before I made my ‘big decision’) with Village Harmony, I saw how the vulnerability of singing can lead to incredible personal growth and connection with community. There were opportunities to practice some solo parts for a concert we were to perform at the end of the camp. Anyone could give it a shot. What was so inspiring and beautiful was to see those people who were terrified of a solo give it a shot. To unveil themselves and be willing to show their vulnerability in front of the group was life-changing. Tears flowed, theirs and ours. It’s going to those places that scare you that encourage our deepest growth. Isn’t healing largely about feeling more connected to ourselves, to our community, to our world? It’s the disconnected state that causes so much suffering. Coming to the awareness that music, especially choral singing in my case, could be so healing on multiple levels was truly what gave me that last drop of intuitive guidance I needed to take the leap. What I see happening in our choir is personal discovery leading to community connection. When we perform, we offer ourselves up through the music and the audience receives that gift. This in turn inspires the audience to open and be moved, achieving a broad sweep of connection through many circuits for all of us. And let’s not forget that last level…..such powerful heart connection does reverberate throughout the world in my opinion. Tell us a little bit about the Rogue World Ensemble? Rogue World Ensemble is a 30ish member mixed choir made up of amateur singers of all backgrounds. We’re a choral family, and it feels that way. We sing what I like to call “the people’s music of the world” or folk music. It’s the music that world cultures grew up hearing in their communities, learning by ear, dancing by feel, giving voice to their life circumstances, their spiritualities, their struggles and hardships, their stories of love. We primarily focus on those regions that have a strong choral tradition (not all do): South Africa, the Balkans, Georgia, Ukraine, North America and others. We will sing music from non-choral traditions, arranging it lightly to work in a choir without hopefully losing the spirit of it. The world also includes our own country of course. We have many choral styles here that we sing: gospel, shapenote, swing, Appalachian harmony traditions. One of the great things about singing in RWE is that I bring international teachers that specialize in certain regions to work with the ensemble. This is essential to approximating any authenticity to our sound. We work on the pronunciation, timbre and vocal styling, and charging our voices with the regional spirit of the music. Of course, we’re all Ashlanders and we can only reach a certain level of “authenticity”, but what we try to avoid is losing all the nuances that make one music distinctively different from another. I think many choirs tend to iron these out and world music starts to all have a similar patina. Some great local musicians accompany us too, namely Naztrave, a Balkan Band, and Cedar Miller, a fantastic percussionist. As the choir began to form what were some of the fears and challenges you worked through in bringing it to life? My primary fear and challenge was that I’d never directed a choir or been to music school. My mentor had inspired me to take this step with the words “all you need is to stay one step ahead of everyone else”. And so I began with choosing the music I wanted to sing, learning all the parts thoroughly, and then I dove right into teaching it. I do have some background in teaching so I found that I did have a knack for delivering the information with a clear method. Before I knew it I was standing in front of my first group of singers listening to them sing their hearts out in harmony, and I was stunned! Rogue World Ensemble was born. Eventually I realized that in order to really create the choir I began to envision I did want a director with more experience. I found Cyrise, our current director, in the Fall of 2009 under very auspicious circumstances. Over the course of three years, we’ve really created quite the group, and we’ve had our challenges along the way; creating structure and policies, managing interpersonal conflicts. Our singers have a real sense of ownership in RWE and they feel deeply about what we’re doing. They have strong feelings about the music, they voice their opinions, their concerns. We want to honor everyone’s voice and I want to remain committed to my vision. I think this arena is truly one of the most challenging and rewarding aspects of guiding a group. Creating community is about loving each other because of and despite our differences. In a choir there are as many points of view as there are people, all of whom have unique personalities, past experiences, and expectations. The going can get rough at times but if we stick it out, all the while knowing we share a deep heart connection to one another and the music, we arrive in that gorgeous sunny meadow of love, acceptance and joy. Finding your voice and working with others to find their own voices through singing has been a passion for you. Will you please tell us more? Similar to how your posture might indicate aspects of your experience and state of being, your voice communicates with a similar gestalt. There are those of us that talk constantly and super loud to those that are timid and rarely speak up, and every possible expression in between. The voice seems to be an aspect of our expression that directly leads to the heart and soul of who we are. Therefore, it’s often a vulnerable channel to follow. This is especially true in our culture where so many people who love to sing do so only in the shower or in the car. This isn’t true in many other countries in which their music is still so alive and integrated into their daily life. Here it seems that we’ve become very self-conscious and we hide our singing voices. Finding one’s voice through singing often involves the experience of being witnessed. I’ve been that witness to many people and it is incredibly moving. A dear friend of mine loved singing and did so in church for years. Then she suffered some awful experiences within this church culture and she stopped singing. She didn’t let out another peep for years until we were enjoying a beautiful bonfire on the winter solstice and a few of us shared songs, poems, and words from the heart. This experience brought her to a remembering of her voice and when her turn came around she began to sing. She qualified it of course with all kinds of “I haven’t practiced, I might forget the words, etc etc etc” but she started. By mid-song she was sobbing and had to stop. Today, 6 years later, she’s leading solos with a 100-person choir. That’s finding your voice!! I love to nurture this kind of transformation, from the tiniest drop to the big gusher. Talk to us about blurring the lines between audience and artists or musical performer? Why is this important, what actions have you taken to bring make this a part of the Rogue World Ensemble? A lot of the music we sing would not in its most natural state be shared in a performance context that sets the performer and audience in drastic contrast. Recently, one of my teachers shared with me the experience of performing with her ensemble in Macedonia. People in the front row were chatting away, children were running around, and some folks were singing along. Her American students had to get used to this cultural way of receiving their performance. There was no disrespect in the audience, they were obviously loving and appreciating it, enthusiastically cheering and hollering when inspired. What was so clear was that the people didn’t feel separate from the music, there wasn’t this hard distinction between performer and audience. It was all just a beautiful scene of community connection through music. In our country, if we had this kind of behavior at a concert there would be all kinds of people complaining….”what parents are allowing their children on stage! They are ruining the show!” “Be quiet up front! Sit down!” So I came up with the idea of the Village Concert, one that was especially for families and children, one in which we could get the audience singing and dancing, encourage the children to express themselves freely. We do still perform shows that are geared for listening audiences too because some of the music we sing does require respectful silence, such as a Bulgarian Orthodox hymn or Georgian lullaby. While in the beginning this was not the case, now at all our shows the director leads from within the group as opposed to out front with their back to the audience. This makes a huge difference in the performer/audience connection. The choir isn’t focused on the director in front but rather the audience. And the audience isn’t looking past the director to the choir. Rogue World Ensemble hosts work shops with traveling folk musicians from around the world, will you tell us about a few of your favorites? I get manic at workshops! I can barely sleep I’m so charged by them. There is nothing quite like working with people who have devoted their lives to singing a particular style of music and who may themselves be from the region of origin. I love working with Nadia Tarnawsky, a Ukrainian teacher from Seattle. She has developed a wonderful method of opening the body to allow it to be a greater chamber of resonance, instilling the awareness that our voice isn’t stuck in our throats. She has a rich tenor voice that is incredibly powerful and a patient and encouraging teaching style. Many members of the choir loved her workshop. I also love working with Zedashe, a Georgian ensemble. They will be returning to work with us next April and will offer a public workshop not to miss. It can’t get more authentic than Zedashe, all Georgians who are masters of their craft and still live and celebrate their music in Sighnaghi Georgia. Because they sing in untempered tuning they often hit notes our ear has never heard. It’s a trip trying to get us to sing notes that sound wacky! Tell us about a few of the ensemble’s favorite songs to sing? Funny, we just took a poll this last session. People’s favorites tend to be the ones that feel the most hauntingly beautiful to them, the chants, the lullabies, as well as the grooviest and fun, those from the Caribbean or South Africa as well as the gospel. The songs we love we keep in the repertoire instead of letting them go and learning new stuff every session. What I find is that the songs we know by heart we love most. It’s not until you’ve actually memorized a song that you really begin to sing it. That’s why we require our singers to memorize the music. And I want our audience to come to know some of our repertoire as well, so they have the experience of feeling “I know this one and I love it!” If it’s always different, again you lose the connection. Consider how you feel when you go to the concert of a favorite band and you know all the songs from the CD because you’ve listened to it a gazillion times. You sing along at the show! Compare this to going to see a group singing songs you’ve never heard. Big difference. What is the most enjoyable aspect of learning music and song by ear? You’re not juggling a piece of paper in your hands trying to find your part! It’s accessible; it calls upon skills that we all have. If you don’t have the paper in your hands you listen more deeply. It’s an experience of greater presence of mind and body in my opinion. And once we’ve learned a piece by ear it gets stuck a little deeper in the body. It’s so natural to learn music this way. It’s also freeing, it honors the movable target that folk music is actually, always changing, always different. A performer can perform the same song multiple times but they will tell you that the experience is different every time. Music is ever evolving, and learning it by ear allows it to be what it is today, right now. Tomorrow we could sing it a little differently because perhaps we’re feeling a different emotion or we’re in a different place. You love to surprise your audience with new songs. Can you tell us about any upcoming concerts you will be having? The Village Concert is happening at the end of this month, on September 30th at the Lithia Bandshell. Our hope is that folks will pack themselves a nice picnic and bring a blanket to lounge on the lawn and enjoy the early fall weather with their loved ones. We have a great show lined up with our Balkan Band and percussionist, lots of dances, upbeat songs, and sing-a-longs. And it’s not just for kids; it’s a great show regardless of age. Any last words you would like to share with our readers? Take a moment to consider how important music is in your life: the song that you danced to when you first met your spouse or the CD you might pop in the player when you’re going through a hard time. The one lullaby you know and you’ve sung to all your kids or the song you can never listen to without turning it to max volume, recalling the college years. I believe music is critical to the health and wellness of a community, right up there with our fire department and city planners. Music keeps the soul alive and without it a community would feel dead. I once read the freshman address delivered by the dean at the Berklee College of Music. He passionately convinced the students of the importance of what they were contributing to the world as music is often relegated to the realm of a hobby pursuit. He said that, in fact, we need it more than food and water. If you were on a desert island or in solitary confinement, you could still sing, and it just might save your soul. So support the local music scene. It adds so much more than you realize to the richness and vitality of our community.